In Thank Your Lucky Stars, theater producers (Horton and Sakall) are staging a wartime charity program. However, the production is taken over by their egotistical star (Eddie Cantor). Meanwhile, an aspiring singer (Dennis Morgan) and his songwriter girlfriend (Joan Leslie) conspire to get into the charity program by replacing Cantor with their look-alike friend, tour bus driver Joe Simpson (Eddie Cantor). In short, Thank Your Lucky Stars is one of the funniest movies that I’ve ever seen, in no small part due to Eddie Cantor. I’ve known about Eddie Cantor for years — but this was the first time I’ve seen him perform. And he was hilarious — and willing to lampoon himself mercilessly. Thank Your Lucky Stars also has two of my favorite second bananas – Edward Everett Horton and C.Z. ‘Cheeks” Sakall – in the center of the story, and they’re both hilarious. There are a lot of musical numbers (see below) that are very enjoyable, as well. “I’m Goin’ North” sung by Jack Carson and Alan Hale, Sr. 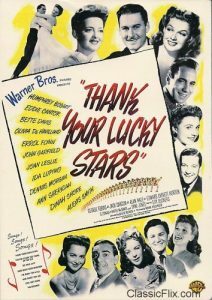 The stars come out to play in the joyous World War II-era Thank Your Lucky Stars. A breezy, behind-the-Hollywood-scenes story about young talents hoping for a big break glitters with specialty numbers featuring Golden Era greats. Highlight include Humphrey Bogart being out-tough-guyed by S.Z. Cuddles Sakall and singers ranging from the gifted (Dinah Shore, Dennis Morgan) to the good sports (Errol Flynn, John Garfield). And Bette Davis’ witty, wry, jitterbuggin rendition of They Either Too Young or Too Old by Arthur Schwartz and Frank Loesser is the cherry on top (Clive Hirschhorn, The Hollywood Musical). Dig in!